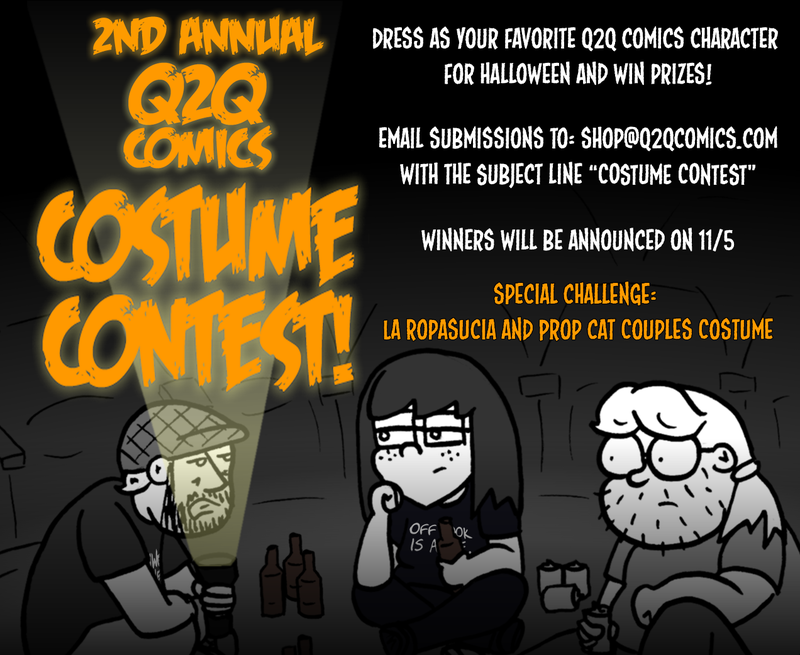 Announcing: The 2nd Annual Q2Q Comics Costume Contest! It’s back again for the second year in a row! The Q2Q Comics Costume Contest! Dress up as your favorite Q2Q Comics character for halloween, submit photographic evidence, and you could win prizes! Email submissions to shop@q2qcomics.com with “Costume Contest” as the subject line. Winners will be chosen on 11/5/15. Submissions will be accepted right up until 11:59pm on 11/4/15. And a special prize will be separately awarded to the best La Ropasucia and Prop Cat couples costume. I can’t wait to see all amazing costumes! Break legs! Winners from Last Year’s contest can be found here! This entry was posted in Shop and tagged costume contest, q2q comics, q2q shop. Bookmark the permalink. ← Q2Q Comics at SPX!